Thirteen by Henry SF Cooper Jr | Blah! When I saw the movie Apollo 13, the one that stars Tom Hanks, I felt that the story it depicted was the embodiment of engineering to me. How a group of clever people could solve an unsolvable problem, fixing a tiny spacecraft that had malfunctioned on its way to the moon with nothing more than the parts they had on hand as they hurtled through space and the combined ingenuity of probably literally hundreds of people — 3 in that capsule and the rest on the ground. The way they systematically tackled the problem but also brought in their own out-of-the-box thinking was, for me, what engineering was all about. 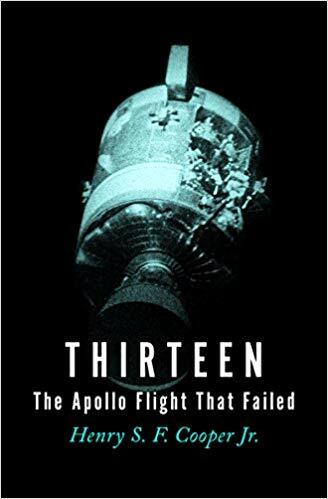 The book Thirteen, but Henry SF Cooper Jr, recounts the Apollo 13 mission in minute detail. Cooper has scoured the logs and transcripts of the mission, interviewed many sources, and has essentially produced what feels like a step-by-step account of the mission and how they fixed the spacecraft to get it back to earth. There is no embellishments here, no extra drama. Cooper recounts what people said and, when possible, what they thought, based on their own words. He doesn’t add extra drama from what is in the record. At times, his recounting of the failure, the way everyone works to first understand and then fix what happened, and the actual return to earth, can seem a little dry. But, its factual narrative makes the actual events that much more impressive because, simply, that’s what happened. Cooper notes multiple times that one reason that the spacecraft failed is that, simply, NASA couldn’t imagine certain things happening. As has been said about the space shuttle disasters, maybe there was some hubris, some overconfidence, in the teams. After all, they had landed multiple men on the moon by that point. They could do anything. And nothing was wrong with their designs. If anywhere, this is where Cooper lets his own biases creep in, as he clearly feels that NASA had gotten too complacent, too proud to even think of such eventualities: “they felt secure in the knowledge that the spacecraft was as safe a machine for flying to the moon as it was possible to devise. Obviously, men would not be sent into space in anything less.” At one point, he highlights how the astronauts complained about being put through simulations of such unrealistic scenarios. After the events of Apollo 13, they complained no more, at least not for a while. The detail Cooper provides on all aspects of the mission instills a sense of wonder at how complex these missions were. To stay warm, they had to roll the spacecraft regularly to change which part faced the sun so that the electronics wouldn’t get so cold. They had to enter the atmosphere at just the right angle: too shallow, and they would bounce off; too steep and they would burn up as they approached earth. With the failing of the spacecraft, they had to figure this all out in real time again, with lots of uncertainties as to the true behavior of the ship. Getting the astronauts home was one engineering challenge after another. Once the spacecraft failed, the very first problem they had to solve was how to keep the astronauts breathing, as their oxygen production had stopped. They also needed water but, something I learned, in space, astronauts don’t feel thirst, even when they are dehydrated, so they didn’t realize how low they were on water. The communications equipment of the lunar module, not meant to be active until they were on the moon, interfered with other devices on the spacecraft, impeding, at least initially, communications with earth. The fuel for the spacecraft was radioactive material. Normally, it would have been left on the moon. Now, they had to worry about where it would fall on the earth. Thirteen doesn’t have the same sense of drama as a movie, but in some ways, it is all the better at conveying the impressive feats of these people as they got the spaceship home. This book won’t be for everyone, but for those with any inclination towards engineering, it provides a great sense of the drama that the profession can entail, in the right circumstances.